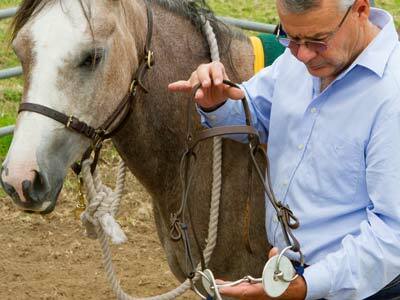 A bit, a headstall or even a piece of string around your horse’s neck is simply a way to give your horse a signal. Walk into any saddlery and you’ll see many different types of bits. There are hundreds of different types of snaffle bits –all shapes and sizes, smooth metal, rough metal, twisted wire, etc etc. There are hundreds of different types of curb bits – short shanks, long shanks, spoons in the horse’s mouth, nose pieces and an endless variety of chains under the horse’s chin or over his nose. All these different bits are made out of all different types of materials. There’s steel, black steel, stainless steel, copper, brass and there’s even brand new rusted steel bits. Then there are halters, hackamores, bosals – the list goes on and on. Put all these choices together and there are probably a million combinations you could have in a bit. I’ve seen lots of “experts” with scientific expressions on their faces, studying different bits. They pick each bit up and look it over and hold it this way and that. They discuss the pros and cons of the bit and speak earnestly to each other in hushed tones. After all, they must be experts if they can understand what all the different bits are used for. I haven’t a clue why you’d ever use any more than a plain loose-ring snaffle bit for any horse to do anything. I guess I’m no expert because I haven’t a clue why you’d ever use any more than a plain loose-ring snaffle bit for any horse to do anything. I’ve never met a horse that couldn’t feel a plain loose-ring snaffle bit in his mouth. I’ve never met a horse that couldn’t feel a headstall on his nose or a string around his neck. A bit, a headstall or even a piece of string around your horse’s neck is simply a way to give your horse a signal. When you pull on the bit, headstall or string, your horse will find it unpleasant to varying degrees. When you don’t pull, your horse will find things relatively easy and pleasant. This is the only way any bit or headstall can be used to train any horse. Pull – unpleasant, give – pleasant. The problem with thin bits, twisted wire bits, chains, shanks, spoons and all the rest is that they apply far too much pressure. Even the smallest movement of the rider’s hands produces severe pressure on the horse’s mouth or chin or nose. Horses ridden in these bits often toss their head relentlessly and have a trembling lower lip. These are signs that the horse is nervous and worried because he doesn’t know when or why the severe pressure of the bit will be applied. Horses don’t need severe pressure to be controlled. If a horse doesn’t respond as you expect, you must always come back a step and show him what you want. No horse will put himself through severe pressure and pain if he understands what to do. No horse needs a severe bit or severe pressure to be trained. It’s ridiculous to think that a severe contraption in your horse’s mouth will help his performance or his movement. Remember, every horse must be confident and relaxed before he can learn. And every movement can be taught to every horse using a plain, loose-ring snaffle bit.